Yoga is one of the most relaxing and popular exercises in the fitness world. But, if it’s so relaxing, why do so many people stress over finding the right yoga mat? Finding the perfect blend of style, durability, and usability isn’t always an easy process. But these yoga mats are some of the better contenders. 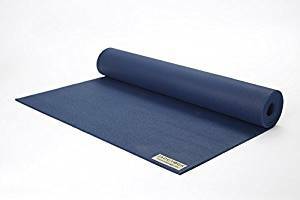 If you’re interested in pursuing many different types of yoga, in all kinds of terrains, then the Manduka PRO Yoga and Pilates Mat is a very promising choice. This mat, measuring at 71 inches by 26 inches, is constructed of ultra-dense foam, so that it will offer you unparalleled joint support while you’re exercising. This extra support means that you will experience fewer joint pains after your yoga sessions! But just because the foam is ultra-dense, that doesn’t mean that it’s ultra-absorbent, as well. The closed-cell surface keeps sweat from seeping into the foam, a situation which is a recipe for carrying the yoga studio smell wherever you go. This makes it a good choice for hot yoga, as well as average yoga. Want to head to the beach, or out to the park? Not a problem with the Manduka PRO Yoga and Pilates Mat! The cushion protects you on any surface. Measuring at 71 inches by 21 inches, this mat is large enough for a variety of poses. Can be used for yoga or Pilates. Has ultra-durable foam for extra resilience. The foam is very thick, giving you a cushion that supports your joints. Closed-cell surface prevents the mat from absorbing sweat from your workout. Completely free of all latex, making it a good choice for those with a latex allergy. Can be used on any and all terrains. 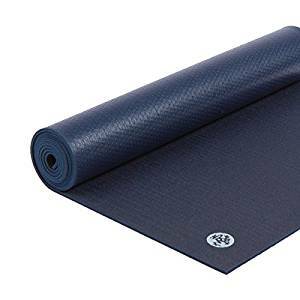 Some users find that this yoga mat can become a bit slippery, making it hard to hold positions. 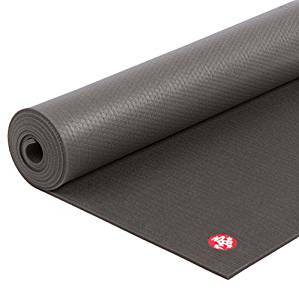 If you’re interested in a wide variety of different yoga styles, then the Manduka PRO Yoga and Pilates Mat is a great choice that is sure to please. The extra support, as well as the ability to keep sweat out of the foam, make it a pleasure to use again and again. Another great choice for anyone interested in a wide variety of yogas, from hot to outdoor and anywhere in between, is the Manduka PROLite Yoga and Pilates Mat. This mat is a great choice for any kind of yoga or Pilates, or even just exercises you need a little cushion for. It’s very durable, promising to never wear down from use. It even keeps its looks, with a guarantee that it won’t peel, fake, or fade. Your joints will be protected by the thick cushioning it provides, while the closed-cell top layer will keep your sweat from seeping into the foam. Tired of your yoga mat always slipping and sliding in between poses? The texture on the bottom of the mat will keep it in place on the slipperiest of surfaces! The only real issue is that it comes with a layer from the factory that you have to scrub off before using. Otherwise, it is very slippery. Thick foam provides more cushion, and thus more support. Closed-cell exterior stops sweat from soaking into the mat. Texture on the bottom of the mat prevents the mat from sliding. Very durable; this mat should never wear down. Will keep its looks, never fading, peeling, or flaking. Provides excellent grip in difficult poses. There is a layer that the manufacturer leaves on that, if you don’t remove it by cleaning, will render your mat extremely slippery. The price is a bit steep for those who only do yoga casually or for beginners. The Manduka PROLite Yoga and Pilates Mat is a good, if a bit pricey and inconvenient, choice in yoga mat. It takes a little work to get it up to snuff, but users report that it is well worth it in the end. If you’re not put off by a little extra work, this is the mat for you. 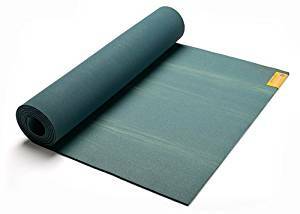 If you like to feel close to nature when using your yoga mat, and prefer to eschew synthetic and other man-made materials, then you’ll like the Tomuno Natural Rubber Non Slip Sticky Eco Friendly Yoga Mat. Made by a small business, this is the best yoga mat that lets you get your crunch on at the same time as your ohm! The main selling point of this mat is that it isn’t made from synthetic materials such as PVC or TPE, but out of natural rubber tree sap. This makes it not only more natural, but gives it a much better grip to the floor. This same grip lets you do the most difficult poses without slipping and sliding. The main downside of this mat, however, is that it is a bit delicate. You can’t use it for hot yoga, and you shouldn’t expose it to direct sunlight. You also cannot clean it with oils or chemical cleaners. It’s even sensitive to lotions on your skin! This mat is made out of all natural rubber tree sap. Gives a good hold to the floor to stop sliding. Great traction to help maintain poses. You cannot use this yoga mat for hot yoga, nor can you use it in hot environments outside, or even in direct sunlight for long periods. This yoga mat should not be cleaned with oils, nor with harsh chemical cleaners or abrasives. When using this yoga mat, you should take care not to use lotions, oils, or any other skin product that could potentially harm the mat. The Tomuno Natural Rubber Non Slip Sticky Eco Friendly Yoga Mat is a nice choice in a natural yoga mat. It’s made of all natural rubber tree sap, which gives it good hold to the floor and prevents sliding. However, it’s difficult to care for, easy to damage, and can’t be used for hot yoga. Another natural rubber yoga mat, perhaps with less upkeep needed, is the Manduka eKO Yoga Mat. This is made out of natural rubber, making it great for those who don’t want their exercise equipment to cause environmental damage by never decomposing, like PVC or TPE. Being made of natural rubber also means that it will provide you with excellent sticking capabilities, though some do say that sweaty palms can lead to some sliding when a towel isn’t used. It’s thick and well cushioned, giving your joints some needed support. It’s also non-absorbent, the closed-cell surface keeping sweat out of your mat. There are a couple of downsides, however. For one, natural rubber smells very strongly, so you should anticipate a mat that smells. Airing it for a few weeks should help. It’s also very heavy, making it difficult to cart to and from the yoga studio. Made out of natural rubber, this mat will decompose, making it better for the environment. Excellent sticking; your mat will not slide all over the floor. Closed-cell exterior keeps your sweat out of the mat. Cushioned for better joint support during yoga. The natural rubber makes the mat smell very strongly, particularly right out of the box. Airing it out for a few weeks is supposed to help. The mat itself is very heavy, making transportation and storage a bit of a problem. Some report that sweat makes the mat slick. For a natural yoga mat, the Manduka eKO Yoga Mat is a good option. It’s not as delicate as other natural mats, and comes with the same benefits of mats made from PVC or other synthetic materials. If you’re alright with the strong smell, the heavy weight, and the slight possibility of slippage, then this is the mat for you! Do you find yourself slipping and sliding when using a yoga mat? Does downward dog become child’s pose once you get sweaty? Then you’ll love the non-slip grip that the Jade Fusion 68-inch Yoga Mat provides! This is one of the best choices for hot yoga, because it helps you keep your grip, even when you’re pouring with perspiration. Made out of natural rubber, the open-cell technology that it uses keeps moisture from gathering around your palms, which is the leading cause of slipping. But great grip isn’t the only great thing about natural rubber. 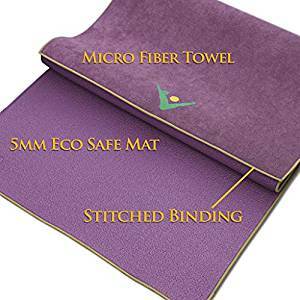 Unlike synthetic materials, natural rubber will decompose naturally when thrown away, making it a very green (or, in this case, purple) choice in yoga mat. Want to help the environment even more? For every yoga mat purchased, JadeYoga will plant a tree. What better reason to buy? Made out of natural rubber. Decomposes completely when thrown out. Has a great grip, so that you won’t slip when you’re exercising with this yoga mat. Natural grip also means that your yoga mat won’t slip beneath you. Cushion, to provide extra support for your joints. The natural rubber is very resilient to wear. With every mat purchased, a tree is planted. Because it is opened-cell instead of closed-cell, the yoga mat will absorb your sweat, rather than wicking it away. You’ll need to clean your mat more frequently, and air it out. The Jade Fusion 68-inch Yoga Mat is a wonderful, natural option in yoga mat. If you don’t having to clean and air it a bit more than other mats, the added traction will be more than worth it. The fact that it is so good for the environment is certainly a big plus! 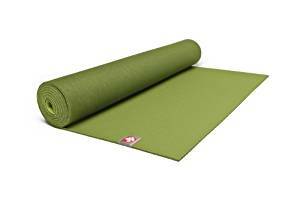 Another great choice by Jade is the Jade Harmony Yoga Mat. This yoga mat is made out of natural rubber, so that it provides better grip and is good for the environment. The open-cell top layer makes it easy to keep your grip while doing yoga, even when your hands become sweaty. Need a bit of extra room to strike the perfect pose? At 68 or 74 inches in length, you’ll have all that you need! And it isn’t a difficult yoga mat to take care of: When it starts getting a bit grimy, you can wash it with soap and water! There are only two real downsides to this mat. The first is that, because it is open-celled, it will absorb your sweat while you work out. The second is that it can be a bit heavy, making transport more difficult. Made out of natural rubber, with no PVC or other synthetic materials. Has a very good grip. Open-cell design means no slipping and sliding, even with sweaty palms. Easy to care for. Wash with soap and water. Has extra length, for more room to spread out. For every mat bought, Jade will plant a tree, further helping the environment. Because of the open-cell design of this yoga mat, the Jade Harmony Yoga Mat will absorb sweat, oils, and lotions. This mat is on the heavier side. Plan accordingly. The Jade Harmony Yoga Mat is a good choice in an easy-to-care-for, all-natural yoga mat, one that is perfect for many types of yoga. You’ll no longer have to worry about sliding during downward dog, and you don’t have to worry about the environmental impact your yoga mat will have. For a good alternative to the bigger-name natural yoga mat brands, you can choose the Hugger Mugger Para Rubber Mat. Made out of all natural rubber, it’s a good choice for both its stickiness, as well as for its environmental impact. Not only does the natural rubber make it stick in place, but it also helps to ensure its durability. Do you need extra joint support when you’re exercising? This yoga mat comes with extra cushion, to provide just that! There are, however, some downsides. Like all natural rubber yoga mats, there is a rather strong smell associated with this one. But, in this case, airing it out for a while doesn’t do much to stop it. Not only that, but it can become very slick when you get sweaty. This makes it a very bad choice for anyone looking to practice hot yoga. Made out of all-natural rubber. Sticks well to the floor and your body, unless you’re sweating. Has extra cushion, to help protect joints while working out. Natural rubber is a very durable surface, meaning it should last you a while. Contains no synthetic substances, such as PVC; decomposes naturally when discarded. Because of the natural rubber, this mat will have a strong smell. This mat becomes slippery when you sweat, making it difficult to use. Not a good choice for hot yoga because of the slipping that sweating will cause. All said and done, the Hugger Mugger Para Rubber Mat is a bit more of a hassle than it’s worth. Though it does work very well dry, and is made of all-natural materials, the downsides seem to outweigh the good points. There are better natural rubber yoga mats to choose from. Sometimes, you just need more room to stretch when using your yoga mat. Whether it’s because you’re taller, work out more vigorously, or simply can’t seem to keep yourself on the mat, the prAna Revolution Mat is a great way to get the extra room that you need. Measuring at 36 inches wide and 86 inches long, this is the largest size of yoga mat that prAna makes. And, though it has all that extra space, it still weighs two pounds less than the others made by this company. Some people do still find it heavy and difficult to move, but others don’t seem to have that problem. It’s also eco-friendly, made out of natural rubber not harvested in the Amazon. Tired of slipping and sliding every time you try to do yoga? This mat cuts back on that, providing for more hold. Made out of natural tree rubber; no synthetic materials. Tree rubber is not harvested from the Amazon, for less environmental impact. At 36 inches wide by 86 inches long, provides quite a bit of extra space. Doesn’t slip while you’re using it, even if your hands are sweaty. Provides enough cushion to protect joints while doing yoga. Durable enough to last for a very long time. Some people find that this mat is heavy, making it difficult to store, carry, or even clean. Natural rubber normally has a noticeable smell to it. The prAna Revolution Mat is a great choice for those looking to spread out a bit. And, if you’re looking for something that can let you minimize the impact on the environment, this is certainly a mat worth looking at. The only downside seems to be the heaviness that some people aren’t fond of. 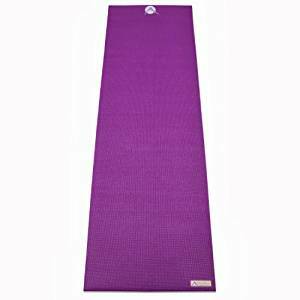 The Aurorae Classic Extra Thick Yoga Mat is one of the cheaper yoga mats on this list, but that doesn’t mean that you’ll be missing out! 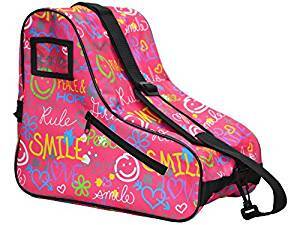 This is a great choice in yoga mat for anyone, of any age. It’s very well padded, making it easier on your joints while your exercising on it. The extra cushion makes everything low-impact! It’s also a very durable mat, made to last through a great deal of use, whether it be indoors or outdoors. And you can easily take it outdoors, because it’s light enough to easily travel with! No more having to cart around a massive, heavy yoga mat wherever you go. The only real downside is that it can be very slippery. However, with the use of the non-slip rosin that is included, the slipping becomes a non-issue. It even works for hot yoga! Measures 24 inches wide by 72 inches long. Completely non-toxic, so even children can use this mat! Very durable, to last through extended use. Lightweight enough for easy travel. Very easy to care for and to keep clean. Unlike some, this mat doesn’t have that typical “yoga mat” smell. Comes with non-slip rosin, to keep you from slipping and sliding while doing yoga. At only $35, this is one of the cheaper mats you can buy. The mat is very slippery to use if you don’t use the non-slip rosin that is included. The Aurorae Classic Extra Thick Yoga Mat is a great low-cost, high-expectation yoga mat for anyone who is either just getting started with yoga, or is just looking for a cheap but rugged option. It doesn’t require a lot of upkeep, and, with the use of the rosin, the one downside isn’t much of a downside at all. Do you mainly practice hot yoga, or do you happen to just sweat a lot? If that’s the case, then the Aurorae Synergy 2 in 1 Yoga Mat is likely to be a good choice for you. The “2 in 1” here means that it isn’t just a yoga mat: It’s a microfiber towel, too! No matter how much you sweat, you won’t slip. In fact, the more you sweat, the better your hold! Because of that, it is best to start off by spraying water over the mat, to make your hold secure. It’s also easy to care for, and can be cleaned either in a washing machine on gentle, or by hand, then hung up to dry. It’s a long-lasting, durable, easy-to-care-for, non-slip powerhouse of a yoga mat. This is a good choice for anyone who needs extra hold! This is both a yoga mat and a microfiber towel. The microfiber towel makes it great for hot yoga. It slips less the more you sweat! Easy to care for, can be washed on gentle in a machine or can be hand-washed. Durable; it will last for a long time. 5mm thick, 24 inches wide, and 72 inches long. Has a focal point to help you concentrate. The mat should be spritzed with water if your hands or feet are dry before starting; otherwise, you will slip. It keeps you from slipping when sweaty, and can be easily cleaned afterwards. Durable and relatively cheap, this is a mat that you’ll actually enjoy using! Finding the right yoga mat can be tricky. There are a myriad of different types, and they all appeal to different people. 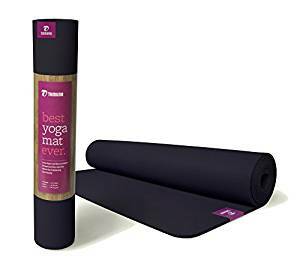 Whether you practice hot yoga, want something light and easily cared for, or simply want a decent all-purpose yoga mat, there’s an excellent yoga mat option here for you!